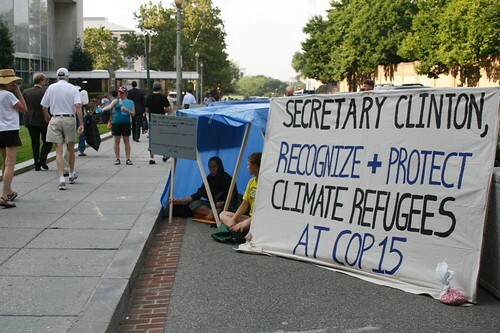 WattHead - Energy News and Commentary: Greetings from the DC Action Factory tent city! We are just hours into our 26 hour tent city marathon. We set-up our camp with relative ease, had a not unpleasant chat with the police, and are just now settling down for the long haul. It is quite literally starting to heat up, and despite the cops mandating that we dismantle our overhead tarps, we are doing our best to keep cool. As uncouth as it sounds, at least our project has an end date. For millions of climate refugees across the globe, drought, flooding, disease, or famine make harsh conditions a permanent reality. It is important, then, that we stand in solidarity with these many millions, and bring their voices to the policy-makers whose decisions will ultimately shape their future. Such action is desperately needed, yet our leaders typically fail in recognizing climate refugees altogether. In high-level talks regarding climate refugees, decision-makers find themselves bogged down in determining even the basic definition of climate refugees (see Morgan's post from last night). It appears that after so much politicking over semantics, world leaders are simply too exhausted to take real steps toward aiding these involuntary migrants. But according to the International Federation of Red Cross, climate change disasters are currently a bigger cause of population displacement than war and persecution combined: current estimates of the number of climate refugees range from 25 to 50 million worldwide, compared to the official refugee population of 20.8 million. World leaders claim that they do not want to complicate the word "refugee," as if they worry about sullying the term for political exiles. Call them what you will, climate refugees are very real; their stories are harrowing, and their numbers are rapidly growing. The Intergovernmental Panel on Climate Change (IPCC) predict that there will be 150 million climate refugees by 2050. Our leaders are performing a gross negligence by ignoring the growing refugee crisis caused by global warming. Not only are we destroying their homes with the pollution of the industrial nations, now we are trying to ignore their existence all-together. But we are asking Secretary Clinton to demonstrate a small act of goodwill, take on the mantle of US leadership, and ensure that the world will take action to address the climate refugee crisis in the years to come. By including language to recognize and protect climate refugees, Clinton will not only take a much-needed moral stance, but also provide for the security of the nation she represents. The millions of people displaced by global warming will inevitably seek asylum elsewhere. Already, rising sea levels caused by climate change are exacerbating tensions between Bangladesh and India, causing India to construct a 2,1000 mile high-tech fence along its border, to cite but one example. The U.S. can expect similar security questions to rapidly arise. Establishing an international process that recognizes, protects, and helps to provide for these refugees will help to prevent a refuge crisis at our own borders. Currently, there is little or no aid available to climate refugees, unlike conventional refugees protected under current international treaties. The recent, tragic death of Ken Bacon, director of Refugees International, has highlighted his life-long work on refugees, and his recent work in establishing a Climate Refugee Center. Secretary Clinton praised the work of Bacon, even as her department tries to ignore the issue. Including language recognizing and protecting climate refugees in the Copenhagen agreement is the first step in establishing this process. Secretary Clinton, act now! Otherwise, what will your legacy be?